The AA&CC is a proud winner of the UTSC 50th Anniversary Legacy Fund for the Entrepreneur Expo. AA&CC staff members have been awarded two 2014 Excellence Through Innovation Awards by University of Toronto. 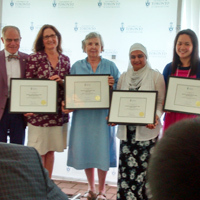 Ruth Louden and Liana Williams were recognized for their contribution to the Tri-Campus Career and Co-Curricular Learning Network (CLNx) and Mariam Aslam and Ruth Louden were honoured for the Flourish Program. AIM Team presented Dr Campbell Merit Award! At the recent Distinguished Service luncheon, members of the AIM (Academic Integrity Matters) Team jointly received the DR Campbell Merit Award. The award celebrates dedicated service to UTSC that falls outside the person’s (or team’s) normal job duties or in the creation and development of a new campus initiative. Shehna Javeed, Academic & Learning Strategist, is a founding AIM group member and has been working with the team since its formation in 2010. Congrats Shehna and the rest of the AIM team! 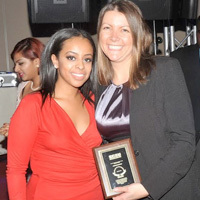 Jennifer Ankrett, AA&CC Director, was presented with the UTSC Staff Award at the Scarborough Campus Students’ Union (SCSU) Spring Formal. SCSU President Sarah Worku presented the award in recognition of Jennifer’s outstanding contribution to enhancing the quality of student life, advocating on behalf of students at UTSC as well as working with and collaborating on various student initiatives. Jennifer is the first AA&CC staff member to win this award. Congratulations! 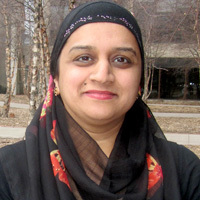 Shehna Javeed, Academic & Learning Strategist, published an article in the National Academic Advising Association (NACADA) e-newsletter, Academic Advising Today. Entitled “Academic Advisors as Valuable Partners for Supporting Academic Integrity,” Shehna describes the important role Academic Advisors can play in impacting and supporting academic integrity initiatives on university campuses. Shehna is a member of the AIM (Academic Integrity Matters) group, an alliance of UTSC departments educating students about academic honesty. Kathy Fellowes, Academic & Learning Strategist, has been appointed to serve on the Advisory Search Committee for the new Vice-President and Principal, UTSC. She is serving in the capacity as both UTSC staff member and as the current Chair of the Academic Affairs Committee. In addition, Kathy was honored at the Distinguished Service event on the St. George campus for 25 years of service at UofT. Kathy has been appointed to serve as Chair of the Academic Affairs Committee for a 3rd term. Congratulations Kathy! Kira Bruschke, Career Counsellor, along with Writing Centre staff from UTSC and University College, co-presented a workshop at Inkshed, the annual working conference for the Canadian Association for the Study of Language and Learning (CASLL). Kira co-facilitated “The Personal Statement: Sharing Frameworks for Instruction,” which explored various frameworks for writing personal statements as well as raising questions for discussion about the appropriate roles writing instructors and career counsellors should play when helping students.